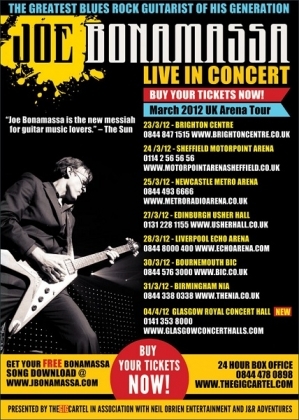 Award-winning blues rock star, guitar hero and singer-songwriter Joe Bonamassa and his ace touring band, have just added Wednesday 4th April 2012 at the prestigious Glasgow Royal Concert Hall to his 2012 UK tour. To mark the news of this special Scottish show, Planet Rock will run a special ticket pre-sale from 9am on Wednesday November 30th via their official website www.planetrock.com. Tickets for the Glasgow Royal Concert Hall date will go on sale to the general public on Friday December 2nd from the 24 hour ticket hotline - 0844 478 0898, and online at: www.thegigcartel.com. Fresh off his successful European tour with Black Country Communion, and rave reviews of BCC's "2" album, Joe's forthcoming UK solo tour will see him perform material from his current studio album "Dust Bowl" plus songs from his vast catalogue of albums including A New Day Yesterday, The Ballad of John Henry, Sloe Gin and Black Rock. Joe will also preview some new songs from his forthcoming studio album due for release in late May 2012. Joe's band includes Carmine Rojas (bass), Rick Melick (keyboards) and Tal Bergman (drums).